Hardwood floors may not come to mind when you think of the well-known tile, stone, and glass brand United Tile. For over fifty years, United Tile has been a leader in quality and trend-setting building products. 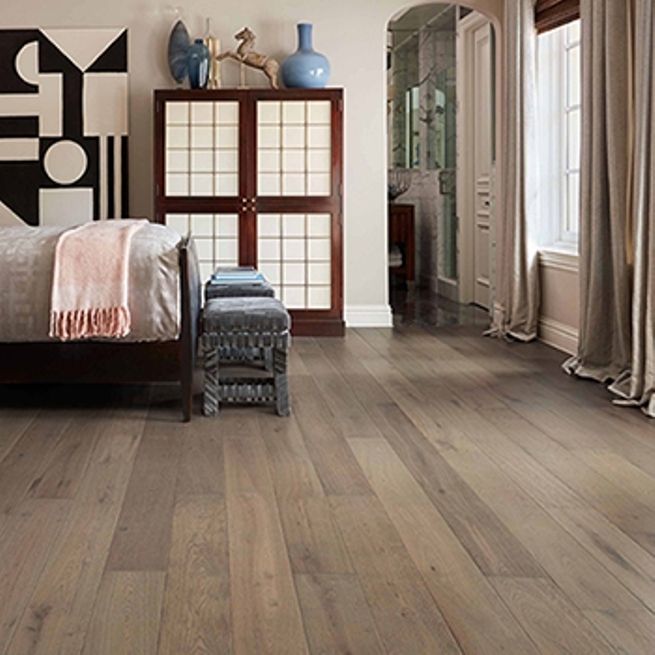 Now, artisanal hardwood floors take their place among United Tile’s impressive product line. There are many reasons to be excited about Plank from United Tile. Each Plank is hand-scraped and tooled by a skilled artisan. These artisans carefully select each board then bring out its unique beauty by hand staining and hand-tooling characteristics such as realistic chatter marks, antiqued edges, hand scraping, and “worm holes”. These are applied without repetition, making each board unique, unlike mass-manufactured hardwood floors. Many engineered hardwood floors are constructed with an HDF core made of sawdust, paper, and resins. Plank from United Tile boasts an engineered core made of seven layers of cross-hatched real wood. This core provides added stability, and that solid wood feel. Each plank is finished with eight coats of Valspar brand dual-stain aluminum oxide coating. It features excellent hardness, UV protection, and great clarity that enhances the look of the wood and won’t yellow over time. In addition, Valspar is HAPS and VOC free. So, visit an Area Floors showroom and see for yourself the Plank from United Tile difference!